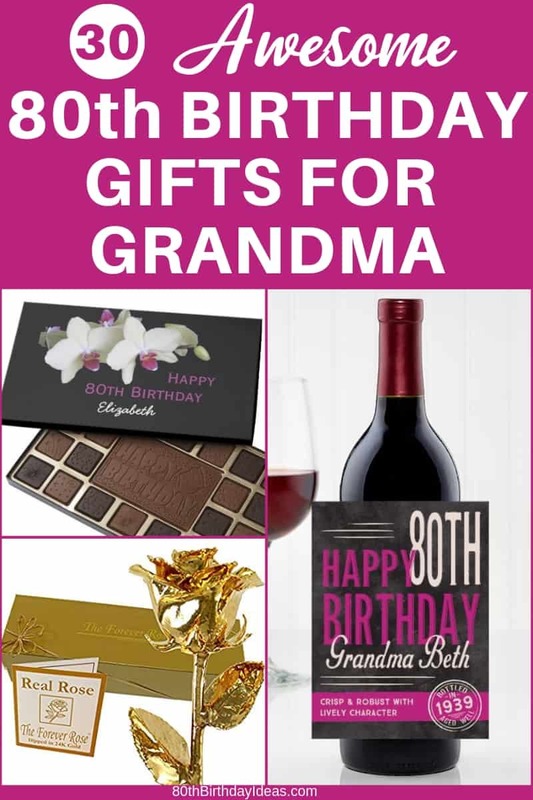 80th Birthday Gift Ideas for Grandma | 30+ Fabulous Gifts She'll Love! 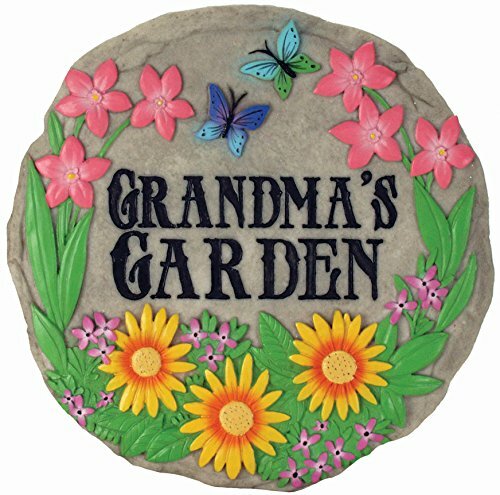 Are you looking for the best 80th birthday gift ideas for Grandma? Delight her with one of these top picks! Quickly find a gift that even the woman who has everything will love! A gift that is custom made just for her is more meaningful and special than off-the-shelf presents. And they're so easy to order - and fast! Most of these gifts can ship out in just one day, so they still work even if you need a last minute gift idiea. As your grandmother turns older, you may have noticed that she's colder than she used to be. 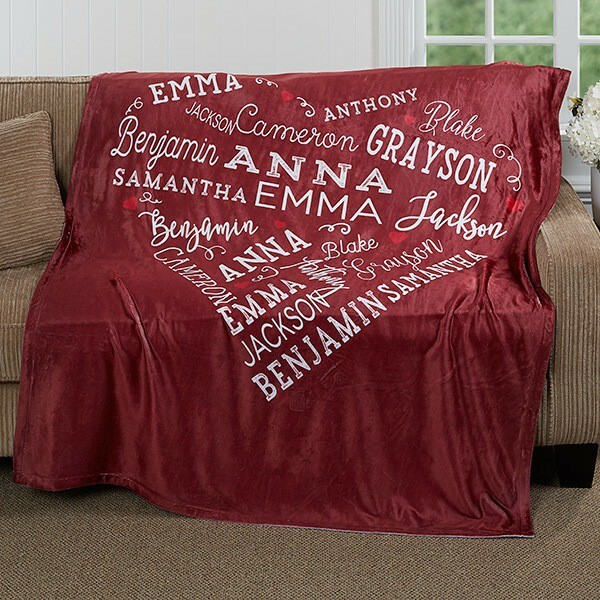 Wrap Grandma in love with this delightful personalized blanket. Add up to 21 names (or meaningful words) to be printed in a heart fashion on this super-snuggly blanket. It's the perfect size and weight for snuggling under while reading or watching TV. 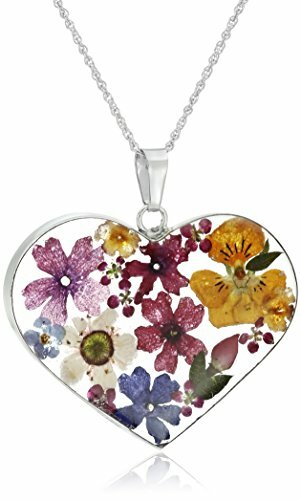 You can also get this gorgeous Close to Her heart design on 40 other gifts, including a cookie jar, mug, flower pot and more. 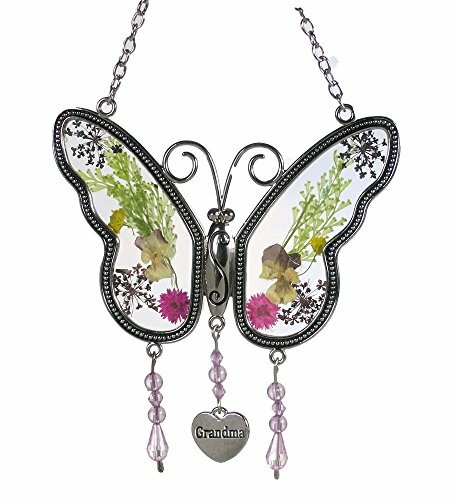 Click here to see all the Close to Her Heart gifts at Personalization Mall. 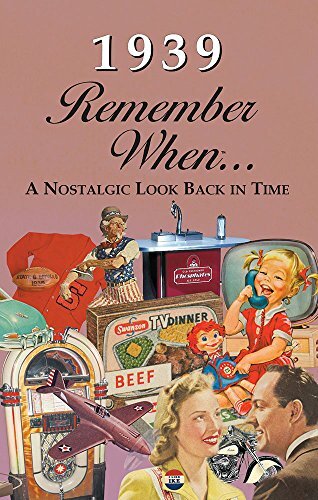 At 80, your grandmother must have loads of wonderful memories to share! This gorgeous personalized book gives her the perfect way to preserve those memories both for herself and her loved ones. She will love answering close to 500 intriguing questions on the elegant, gold-tipped pages. It's a meaningful gift that will spark conversation and memories. She will enjoy working on this fun project for months to come. She can answer a question or 2 whenever she feels like it. 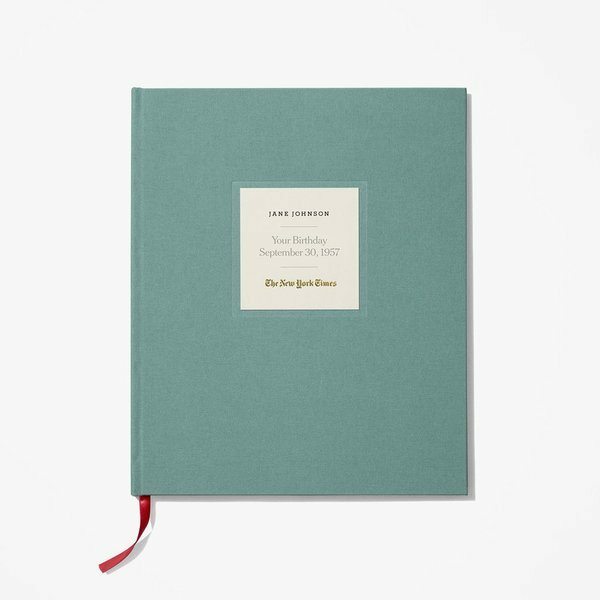 Treat Grandma to a stroll through history with The Custom Birthday Book by The New York Times. Unique gift features every New York Times birthday front page from all 80 years of her life! 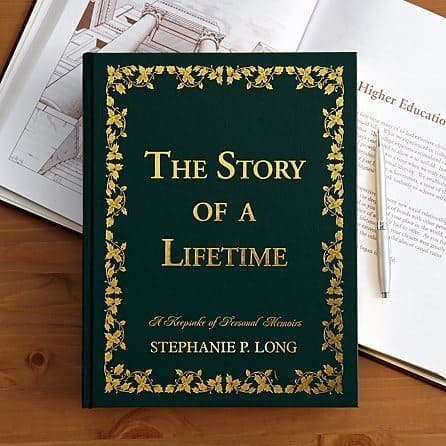 80 years of memories all wrapped up in one fabulous personalized book (available in 6 colors). It's the perfect gift for the grandmother who has everything! Wondering what to get the 80 year old grandma who has everything? 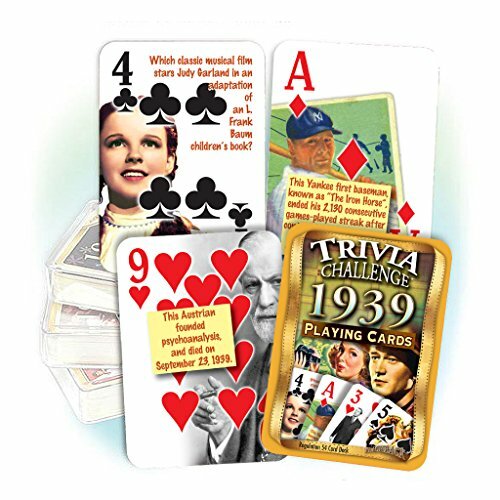 Surprise her with this unique personalized "The Day You Were Born" canvas that's chock-full of fun trivia about what life was like 80 years ago! Click here to see additional "The Day You Were Born" gifts. Many people think that there is a list of traditional birthday gifts for each year. Those lists are for anniversaries, not for birthdays. Some of the time-honored traditional birthday gifts for women include jewelry, flowers and candy. 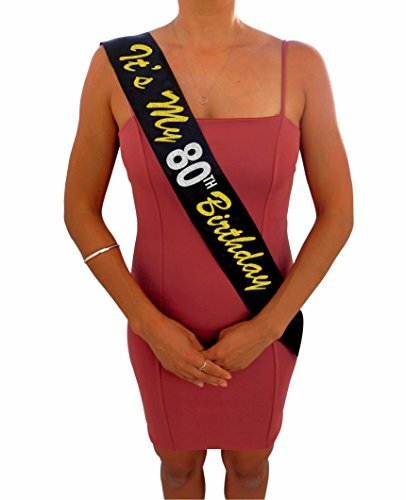 Here are some fabulous ways to give tailor those symbolic gifts for an 80th birthday. 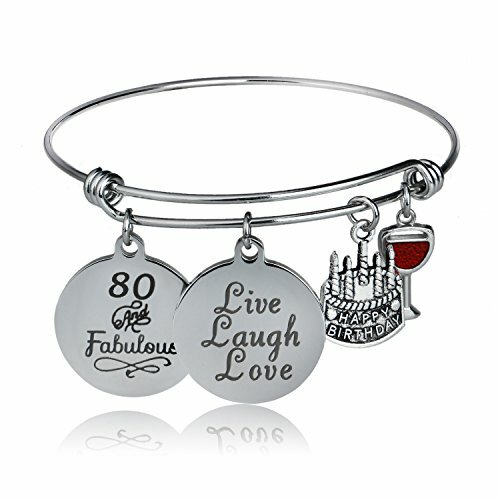 Delight the fashionable grandmother with this beautiful symbolic 80th birthday gift! 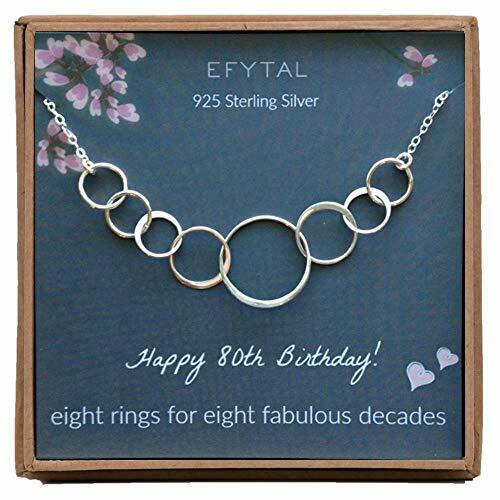 Lovely necklace features 8 intertwined rings...1 ring for each decade of life. 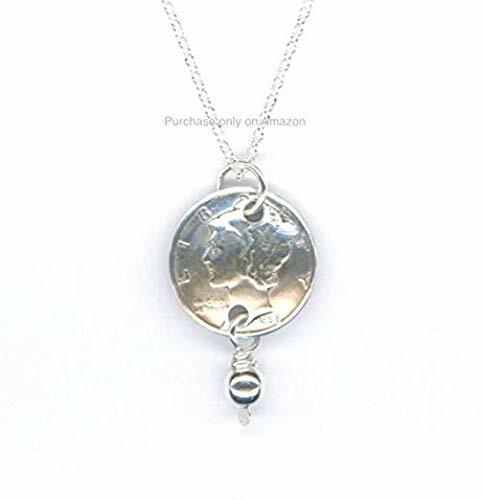 Available in sterling silver, mixed metals, or you can choose to have her birthstone dangle gracefully in the center. 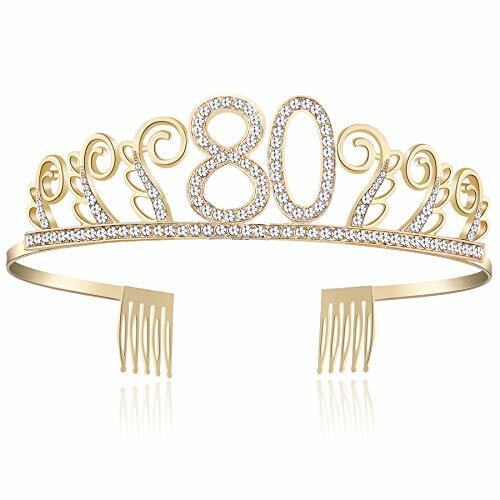 A wonderfully classy way to represent "80" in jewelry form! 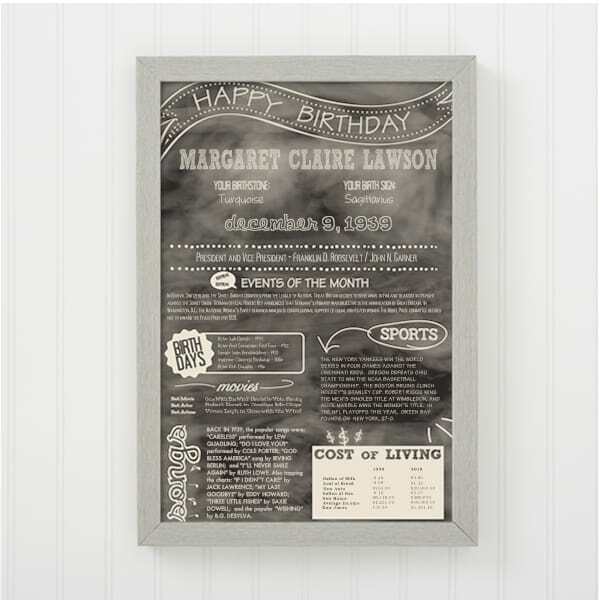 A milestone birthday like this is the perfect time to honor Grandma's love for her family! 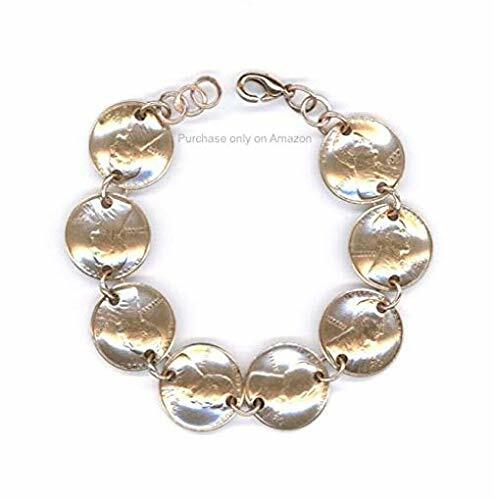 A necklace, bracelet or ring that features her grandkids' names or birthstones is a precious gift that she will treasure long after her birthday. 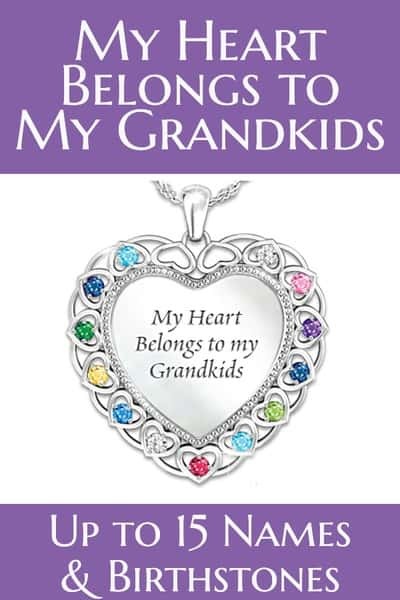 The necklace pictured above is perfect for the grandmother who's been blessed with a large family, as she can add up to 15 grandkids' names and birthstones. Click here to see more Grandmother Jewelry at Bradford Exchange. Flowers are always a thoughtful birthday gift! If you need an 80th birthday gift for same-day delivery, check out the great birthday flower selection at FTD. If you have a little bit more time, however, it's nice to commemorate this milestone birthday with a more unique floral gift. Here are some of the more popular 80th birthday flower gifts. Delight Grandma with a stunning real rose that's dipped in 24k gold. She'll enjoy this flower for years to come - and it will be a wonderful memory of her 80th birthday! This elegant gift is also available in silver, platinum and rose gold...click the button below for details. 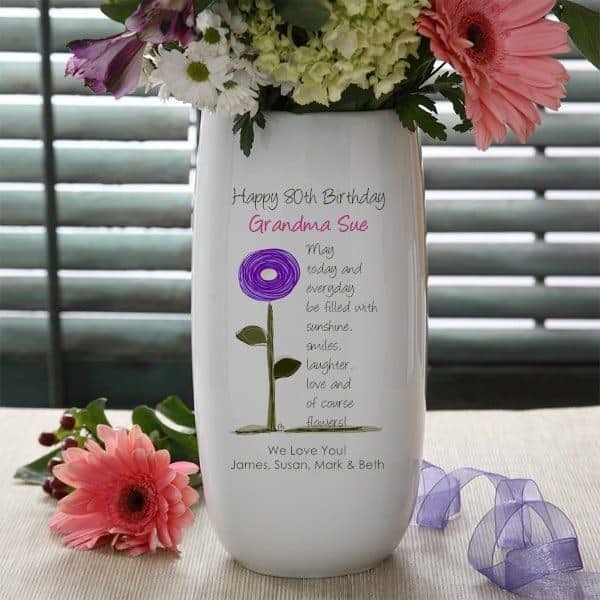 Delight Grandma with this beautiful personalized 80th birthday flower vase on her big day! Choose from pre-written verses, or you can write your own loving message. 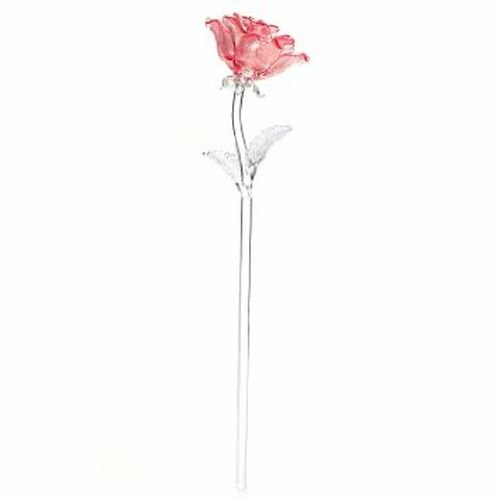 Just add her favorite flowers - she'll love using the vase long after the flowers have faded. 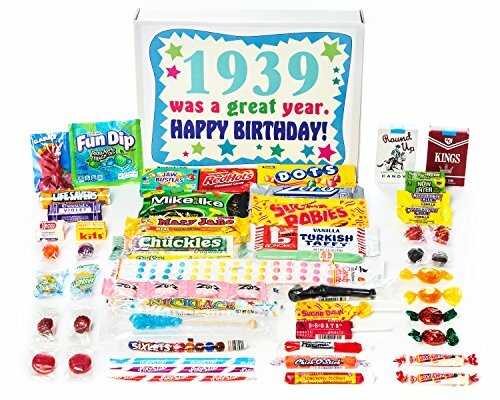 Candy is another fabulous traditional birthday gift that your grandmother is sure to enjoy! 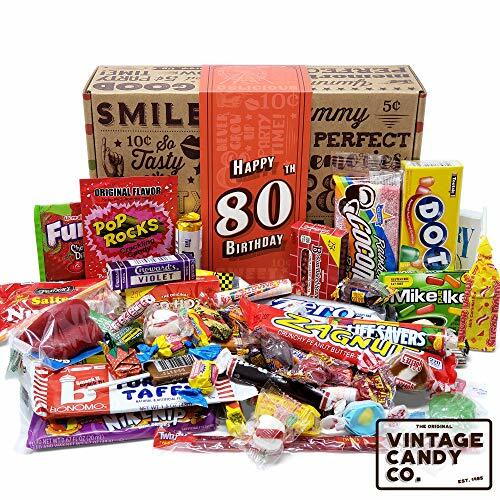 Check out these popular candy gifts that are perfect for the grandma who is turning 80. Looking for a fun gift for the grandmother with a sweet tooth? Surprise her with personalized box of scrumptious chocolate! 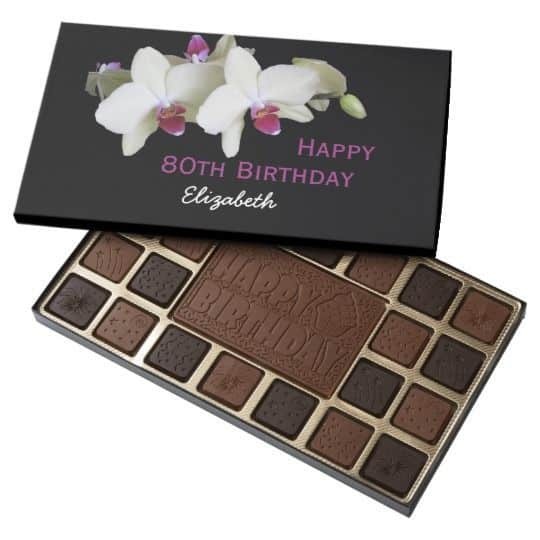 Zazzle offers over 40 lovely boxes of chocolate that are especially designed for someone turning 80. Each box is available in your choice of elegant Belgian milk or dark chocolate featuring a cheerful "Happy Birthday" design. A sweet gift that Grandma will love eating - and she can use the box to store cards, jewelry or other small items after she's finished the goodies. Looking for an inexpensive candy gift that she'll love? 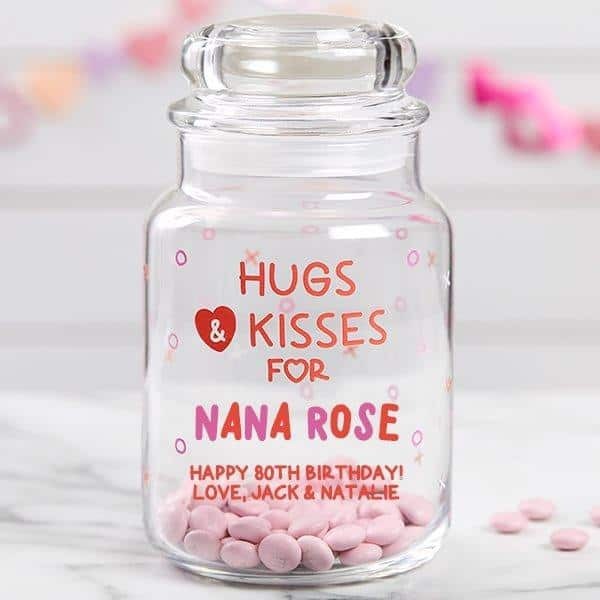 This festive personalized candy jar is under $25, and is a fun way to celebrate this momentous occasion. Add Grandma's favorite candy to create cute gift that's perfect for sharing. You can choose to have Lifesavers included with the gift, or consider something really unique, such as personalized M&Ms (the ones with pictures are really fun). Hershey's Kisses or miniature chocolate bars are also clever fillers, and you can order 80th birthday wrappers from Amazon to make them even more special. Can't decide between chocolates and flowers? You don't have to when you send this beautiful gift that combines both! 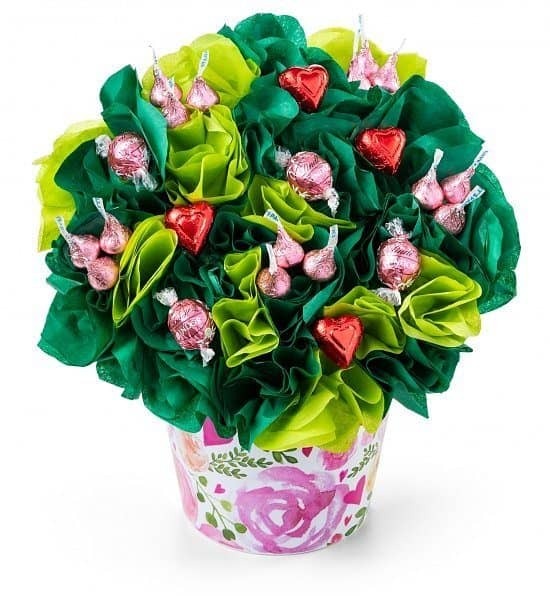 Delightful "bouquet" features Lindt truffles, Hershey Kisses and elegant Italian chocolate hearts all hand-assembled to resemble a bouquet of flowers. An impressive and memorable gift that's delicious! Click here to see all of GiftTree's elegant chocolate gift baskets. You don't have to spend a fortune to get her a birthday gift she'll love! Check out these delightful gifts that are all priced under $25! Is Grandma a wine-lover? Then a personalized bottle of wine is the perfect gift! 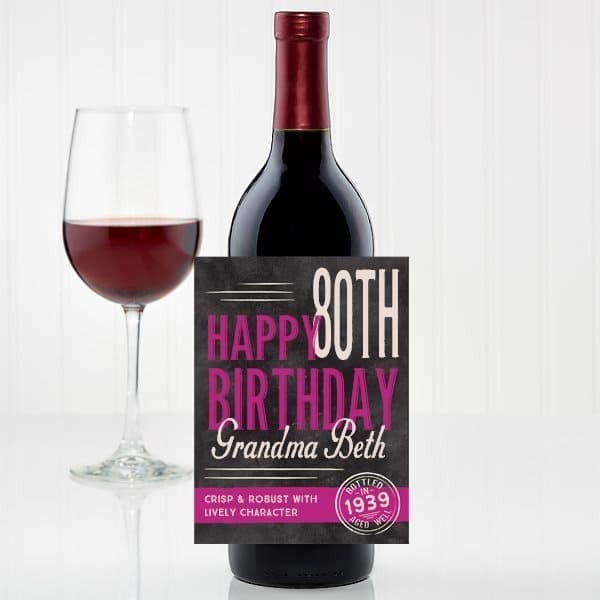 Add your own text to this wine bottle label (available in teal or magenta). Then just stick the label on her favorite bottle of wine to create a memorable gift she'll love! Click here to see all personalized wine gifts at Personalization Mall. Looking for an affordable 80th birthday gift for the woman who has everything? Deck her out in a cute "Made in 1939" shirt! The shirt runs a bit small, so consider ordering one size up. Click here to see additional 80th birthday shirts for women. Make Grandma smile on her big day - and every day after that - with this fun 80th birthday cofffee mug! It's a cute stand-alone gift, or you can fill it with flowers to make a festive little bouquet. Or add a small bag of coffee and some cookies or candy to make a small gift basket. If you're an Amazon prime member, be sure to take advantage of free shipping! 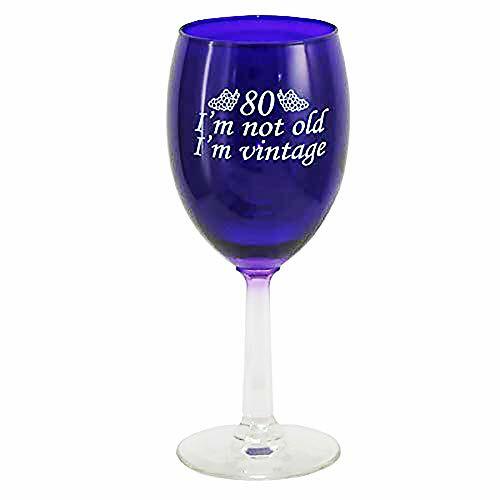 Click here to see more 80th Birthday coffee mugs. Want to See Anything Again?